In January Choden Rinpoche, one of Lama Zopa Rinpoche’s gurus, visited two Australian prisons: Long Bay Correctional Centre in Sydney on January 7 and Karnet Prison Farm just outside Perth in Western Australia on January 30. On a whim, the nurse at Karnet had phoned Rinpoche and asked if he would visit the prison, said Liberation Prison Project (LPP) teacher in Western Australia, Ven. Drolma, who visits Karnet once a month. At Karnet Rinpoche was accompanied by LPP Australia’s chaplain coordinator Ven. Aileen Barry, administrative assistant Margaret White, and Ven. Drolma. 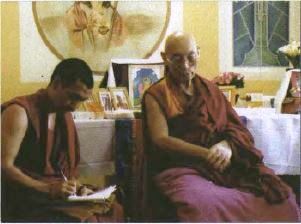 In Sydney, the resident teacher of the FPMT center Vajrayana Institute, Geshe Samten, and translator Ven. Yeshe joined Ven. Aileen and Margaret at the prison.